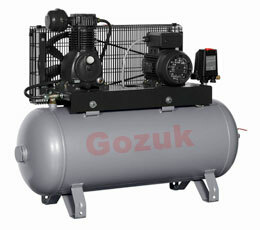 One of the most common methods of varying pump shaft speed is to use a VFD. These VFDs take advantage of the fact that torque, speed and horsepower of an AC electric motor are related to the frequency and voltage of the electrical power supply. Energy Savings result from reduced electrical costs by reducing the speed of the pump and by better temperature control - preventing temperature over-shoot (over heating) in the zones. 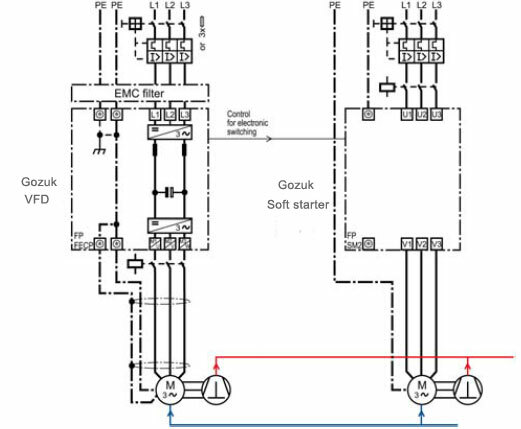 In many applications the pumps are oversized (10 to 15%), so even in maximum heat load conditions, the maximum pump speed with the variable frequency drive is less than before the retrofit. 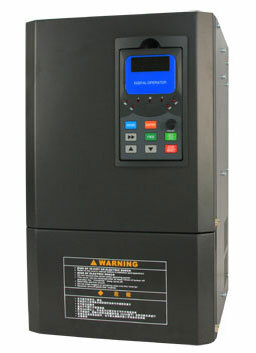 A single variable frequency drive (VFD) may control 2 or 3 motors at a time, multiple motors control is usually done because of budget considerations. 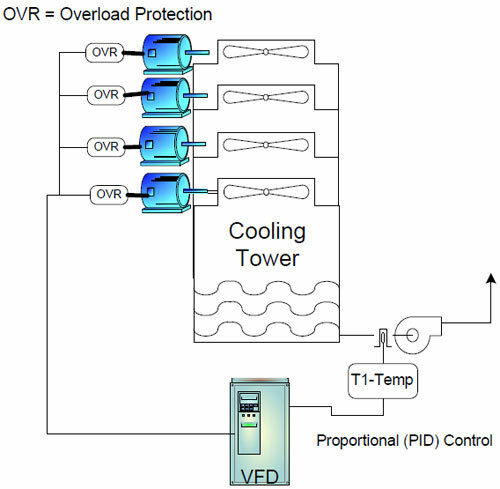 When in this example below, a cooling tower with 4 equally sized motors are controlled by one variable frequency drive. Please keep in mind that you can only set the VFD to V/F mode control if you control multiple motors by one variable frequency drive, never set variable frequency drive to any vector control, even at open loop with vector control, otherwise the variable frequency drive will fail. The purpose of this paper is to present possible solutions that can be used by mining companies for the mining and processing of stones for civil construction using Gozuk Variable Frequency Drives (VFD). 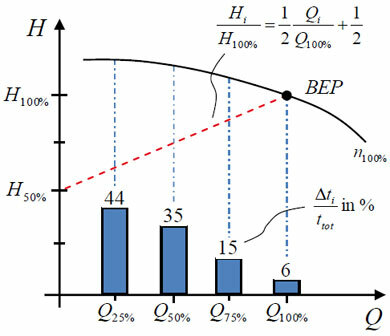 Within this context this paper presents an approach of the mining processes, types of activities and possible gains with productivity, energy saving and reduction of mechanical breaks. From the conveyor belts of the mineral, crushers, size selecting screens for the crushed stones to even on the air filtering systems (bag filters), the variable frequency drives can be used with significant gains both in energy saving and in the increase of equipment production as well as in reducing mechanical breaks and stops for maintenance. 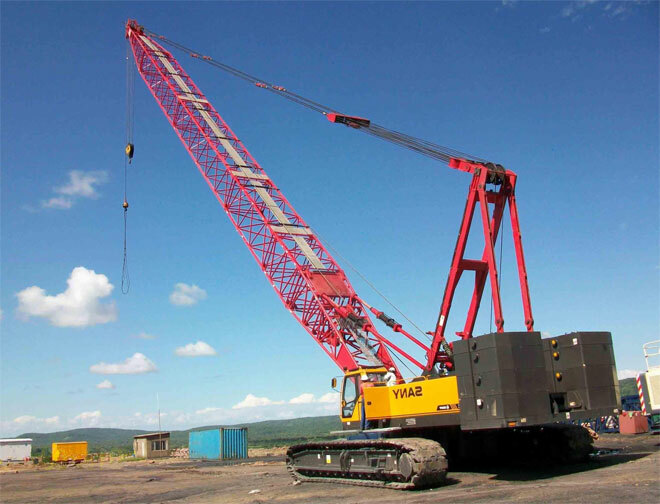 The mining process is very diversified and the composition of the ore/stones also varies even in the same mine which requires for the process to adapt to each case. It isn't always possible to achieve the wanted quality and ideal productivity with machines built considering an average composition or a specific case and without the use of variable frequency drives to set the speed. Can I calculate the VFD energy savings? I am of view that the variable frequency drive savings are rather application oriented. In constant torque applications like conveyors etc. the VFD savings as compared to DC drives are not great but savings are tremendously large compared to Eddy Current drives which now a days are rare to find. 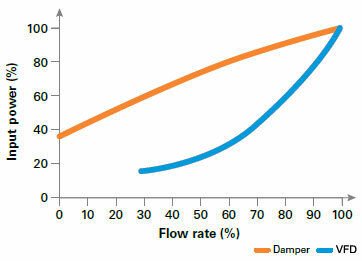 On the contrary, applications exhibiting centrifugal load characteristics yield tremendous savings depending upon normal running speed as a ratio to peak design speeds. Even one can expect to the tune of 65% to 70% depending upon empirical situations.